WACO, TX — Savage Finds Antique's in Waco has new classes for anyone looking to add more of a vintage look to their home. Classes range from customizing pillows, tiles, tea towels and more. 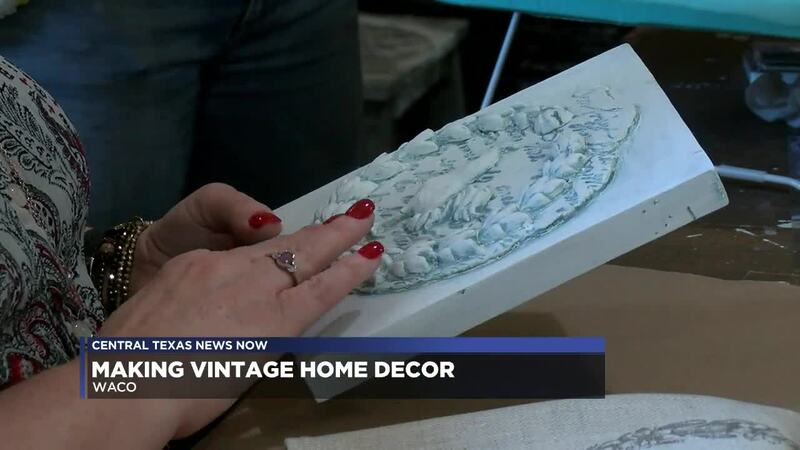 Vintage decor is becoming more popular in homes and Tami Macarthur, the co-owner of Savage Finds Antiques, said she knew she wanted to not only sell vintage things, but be able to make them as well. She wanted to be able to personalize each thing, she says she has yet to see the same thing twice. "There's so many possibilities," Macarthur said. "We call them make and takes so people come in make them and they're small enough people can pack them in a suitcase and you can take it with you." The classes started earlier this year and Macarthur has already seen a great response from the community. Each class is $24.95 and can take up to an hour. "Just to be able to personalize it, you can have a lot of fun with it," Macarthur said. By providing hundreds of stamps, you can create any design you wish on your tile, tea towel or pillow. The classes provide all the material. Once finished you get to take home four tiles, two cotton and one linen tea towel or a 20x20 sized pillow case. To book a class or learn more about Savage Finds visit their website .